It was a milestone victory four years in the making. 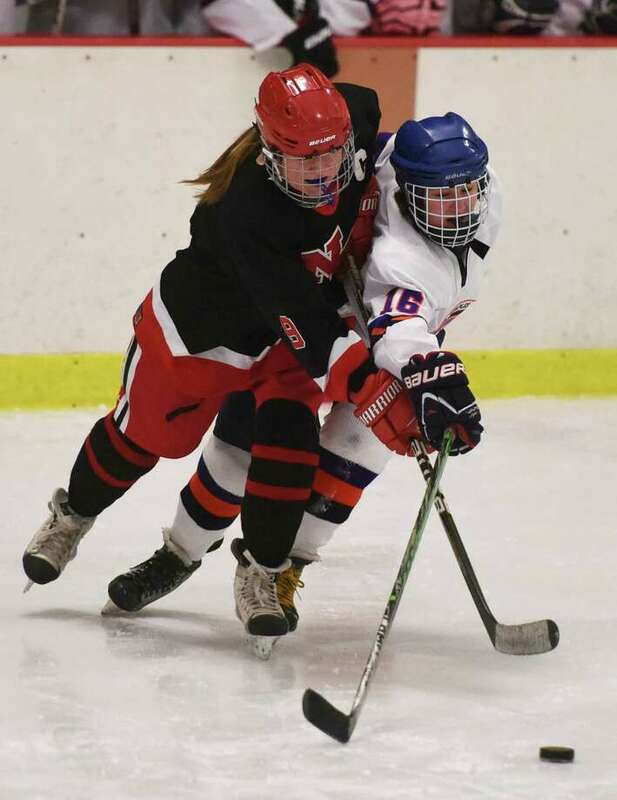 History was written Wednesday night at Terry Conners Ice Rink in Stamford when the Stamford-Westhill-Staples Co-op girls ice hockey program posted its first-ever triumph over New Canaan, 7-3. "This is a victory that puts attention on us. This win will give our program respect," SWS co-coach Eli Williams said. "This win is the culmination of four years of hard work. This is the result of a work ethic that was put in place four years ago and carried forward by this group of girls." It was indeed a champagne and caviar evening for the co-op team. SWS responded from a 1-0 deficit after one period to score three goals in the second period and four more in the third period -- including a trio of tallies in the final 4:27. "This win is a huge turning point for the program," said SWS senior forward Cassie Miolene, who finished with two goals and one assist. "Now we know we can take the team further from here." Indeed. After collecting six victories last season, Stamford-Westhill-Staples suddenly sports a gaudy record of 7-2 overall and 5-2 in the FCIAC so far this season. "We have a momentum now that is irreplaceable," said SWS senior Meg Fay, who had a hat trick. "We are strong. Now we know we can do anything." With SWS goalie Claire Parry registering 22 saves and the SWS defense and forwards blocking numerous shots by New Canaan, Stamford-Westhill-Staples was relentless in transition Wednesday. Kyra DalBello scored the other two SWS goals. "I came into the program as a freshman. I never imagined we could get to this point," said SWS junior Rachel Stanford (two assists). "The six games we won last year was a start in the right direction. This year the entire state is finding out who we really are." As for New Canaan (6-4, 4-2 FCIAC), veteran coach Rich Bulin has a different type of group this year. The 11 seniors on the roster are mixed in with sophomores and freshmen still learning what high school hockey is about. The Rams don't play the elegant tic-tac-toe hockey of their FCIAC and state championship years. And missing starting goalie and tri-captain Sarah Klearman due to injury Wednesday was a huge blow. "We had a tough night," Bulin said. "But give Stamford-Westhill-Staples all the credit. They did the hard work. They took good shots. They earned this big win for them. They did exactly what they needed to do." And now, Stamford-Westhill-Staples -- which lost to powerhouse Darien by a 3-0 margin earlier this season -- must continue moving forward. SWS -- which has taken a giant step forward this year by fielding a deep roster of 26 players including six seniors -- is hoping to play an outdoor hockey game against West Haven Friday at 6 p.m. at Longshore. "The girls keep pushing to be the best they can be. They believe. They see that hard work pays off in victories," Williams said. "They understand nobody does this by themselves. Everybody in the family has to pull their weight. Now I expect to win every night with these girls. There's no reason they can't do special things this season." "The best part is how rewarding this is for the seniors," Miolene said. "It's really been an uphill battle for that group. It's excited to see the hard work and many hours pay off." "To go from the launching of the program to a point where three schools work together," said SWS co-coach Phil Miolene. "To experience success like this is so gratifying to see." Records: New Canaan 6-4, 4-2 FCIAC; Stamford-Westhill-Staples 7-2, 5-2 FCIAC. Goals: NC -- Catherine Granito, Gianna Bruno, Mackenzie Lewis. SWS -- Kyra DalBello 2, Meg Fay 3, Cassie Miolene 2. Assists: NC -- Emily Patch 2, Brooke Deane. SWS -- Rachel Stanford 2, Claire Miolene, Cassie Miolene. Goalies: NC -- Sarah Street (6 saves). SWS -- Claire Parry (22 saves). Highlights: SWS -- SWS Co-op's 1st-ever win over New Canaan in its four-year existance.